One of the leading concerns that people express about epoxy garage floor coatings is hot tire pickup or hot tire lift as it is sometimes referred to. There is nothing more discouraging than applying a nice coating to your floor only to have patches of it peel up or pull away where your car tires sit. So let’s discuss what hot tire pickup is, what causes it, and the best methods to prevent it. The internal temperature of the tires on your vehicle can get very warm and even hot; particularly when you have been driving at highway speeds. As a result, the tire expands slightly from this heat. Once you park your car in the garage, this heat transfers to the tread of the tire and then to the epoxy coating underneath. Once the tire starts to cool, the footprint of the tire will contract slightly causing the tire to literally grab and pull at the surface of the epoxy. This grabbing and pulling in conjunction with one or more contributing factors can cause the tire to pull the epoxy right up off the floor. If you avoid these contributing factors however, you should never have issues with hot tire pickup. So let’s review what some of these contributing factors are. Perhaps the most common factor to hot tire pickup is the use of an inferior epoxy coating. Inexpensive water based epoxy kits are the biggest culprits. The heat that the tires transfer to the surface can actually start to reactivate the curing process of the epoxy due to their low heat tolerance. As a result, the epoxy can soften under the tires. 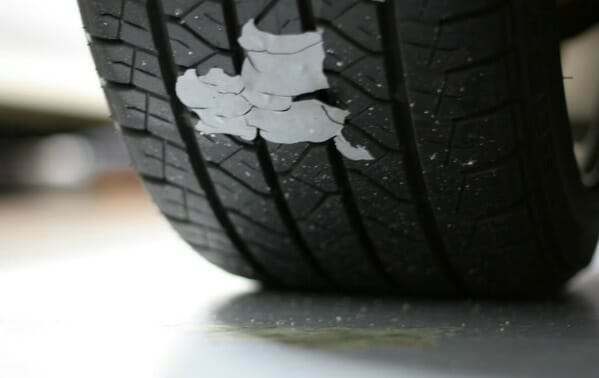 When you combine the softer epoxy with the weight and force behind the constricting tire tread, the epoxy can delaminate and pull right up off the surface of the concrete; sometimes even sticking to the tire when you back your car out of the garage. It’s extremely important that the concrete be cleaned and profiled properly before applying an epoxy coating. This requires that all dirt, oil, stains, waxes and previous coatings be removed. Additionally, the surface needs to be prepared (profiled) by means of acid etching or preferably grinding of the concrete. This process opens the pores of the concrete in order for the epoxy to form a good mechanical bond. Epoxy does not adhere well to smooth concrete. Failure of to do any one of these procedures properly can result in a poor mechanical bond. A poor bond in conjunction with the effects of a hot tire can cause even the best epoxy coatings with higher heat tolerances to pull up over time. Note: Most inexpensive water based epoxy kits that you can purchase from your local home improvement centers come with a less aggressive citrus based clean and etch product. In many cases this etch will not profile the concrete sufficiently which only contributes to the likelihood of a poor bond. One contributing factor that is oftentimes overlooked is the buildup of tire residue embedded in the bare concrete. This is usually found where the car tires always sit. Tire dressing on concrete falls into this category as well. Tire manufacturers include plasticizers and paraffin in the mix of their rubber compounds. Plasticizers are a blend of polymer compounds that help to create a more flexible rubber for the tire. The paraffin waxes are used as ozone protection to prevent the rubber from losing its black color and to protect against cracking. When a tire gets hot, these plasticizers and paraffin oils will migrate to the surface of the tire where it can get deposited on the concrete where you park. If the concrete has not been cleaned much over long periods of time, this residue can build up within the concrete where the car tires sit and prevent epoxy from adhering to it. Tire dressing are a more difficult culprit. They have a blend of silicone agents that keep the tire looking shiny and black. The problem with this is that the silicone tire dressing acts as a sealer if it gets on the concrete. If tire dressing has been sprayed on or applied liberally to the tires where the car usually parks, the over spray and drippings from the silicone in tire dressing can actually seal the concrete over time and nothing will stick to it. It’s not that difficult to avoid hot tire pickup with epoxy coatings. If you follow the methods below, you should have an epoxy coating that will last without issue. Water based epoxy coatings with high solids content, solvent based epoxy, and 100% solids epoxy are superior to the inexpensive water based, single coat epoxy kits. They use newer and better quality epoxy formulations that have higher heat tolerances and varying degrees of better bonding characteristics depending on which product is used. They also provide for a much thicker coating. Just like most any other product, you get what you pay for and epoxy is no different. Though the better quality epoxy coatings cost more money initially, the extra dollars spent will reduce the frustration of hot tire lift as well as increase the life of your garage floor coating. You actually save money in the long run. The hardest part of applying an epoxy coating is the prep work required for the garage floor. The concrete must be cleaned well and profiled correctly. If you do a good job of this then you will reduce the likelihood of hot tire pickup as well as peeling epoxy. Etching your garage floor with muriatic acid or phosphoric acid will provide for a much better profile than that of a citrus etch. If it is within your means, grinding the concrete is even better. These methods will provide for a superior surface for the epoxy coating to bond to. Make sure to do a water test of the concrete surface to insure that the concrete is profiled correctly. You can do this by dripping a few drops of water on various areas of the garage floor. If the water is absorbed quickly into the concrete then the profile is good. If the water beads up or takes more than 20 seconds to be absorbed, then you need to profile it again. Be sure to check the areas where the car tires sit using this same method. 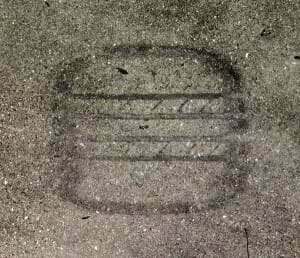 If you had tire residue, these areas will appear a little darker than the rest of the concrete. If it passes the water test then you are good to go. If not, you will need to clean the area again or grind the concrete further to remove the remaining residue. 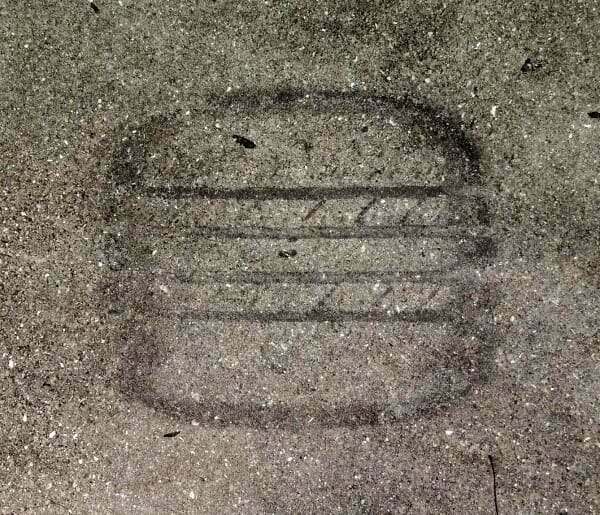 If you suspect the culprit is from tire dressing, then the only method that really works is to grind these areas of the concrete until it is removed. For the extreme cases, your best alternative is to use an oil stop epoxy primer on these areas. Note: Acid will not clean concrete, nor will it break down oils and silicone residue. Acid only works by reacting with the lime in concrete. If the concrete is covered with these residues, the acid will just sit there and do nothing. Epoxy primers are specially designed to penetrate deep into the concrete to provide a very strong bond. When the base coat or color coat of the higher quality epoxy is applied over it, they bond together chemically to provide for an even stronger bond. If you apply an epoxy primer to the concrete first in conjunction with a better quality epoxy coating, you will eliminate just about any chance of pulling up the epoxy coating with your tires. Remember that the majority of problems associated with epoxy peeling up under car tires is due to the use of cheap epoxy coatings and poor floor preparation. If you apply the above methods with a better quality epoxy coating, then you should eliminate any chance of your epoxy experiencing hot tire lift. DIY homeowners and professionals install epoxy garage floors everyday using these methods and with great success. The last step in my project was to put down the clear urathane…….I was told to put shark grip in it so the floor would have traction and not be slippery….I did this but it looks like parts of my floor are not drying clear like it should……..what can I do do get this out…….do I need to regrind the clear and start over?? ?…..I have enough epoxy and clear to do those steps again. Hi Mike. SharkGrip can give the clear a little bit of a cloudy look depending on how much is used and whether or not it clumped or not. It’s more noticeable if you elect not to put down color flake. If you mixed it in with the urethane top coat, it’s important to remix as you go or it has a tendency to sink to the bottom. The roller then picks up big clumps and disperses it out in patches. If you don’t like how it looks after it has cured, you can use a floor buffer with an 80 grit sanding screen to remove the top layer of the clear. Sweep and vacuum the surface and then wipe it down with denatured alcohol applied liberally to a towel. This will pick up the remaining dust. You can then reapply the clear. When using polyurethane with SharkGrip, we like to mix it in the bucket, pour a few small ribbons on one section of floor, and then roll it out (don’t forget to back roll). After that section is done, give the polyurethane another quick remix in the bucket to suspend the SharkGrip again and then do another section. I did mix it in a bucket then poured it out onto the floor…….but like I stated there are sections that look more cloudy than other spots…….I really liked how shiny the epoxy looked on the floor……..I’m just wondering if I made a mistake using the shark grip…..Its my first time using it…….also…..how long should I let it dry/cure before Making the call on sanding it off…….I’m very bummed it didn’t dry clear……I’m still wanted the high shine I had. If I’m not satisfied with the outcome……can I sand it off and put down another coat of the epoxy then put down just the clear…….what do you recommend for a anti slip additive. SharkGrip and other micronized polymers like it are the least visible anti-slip additives. Aluminum oxide is even more visible. It’s the trade off for creating an anti-slip environment. If you live in an area of the country where your garage floor sees a lot of water or snow, it’s a good idea to have it. You can always sand it off and apply another coat of epoxy if you elect to do that. Give it a full 7 days to cure first. Epoxy by itself can provide for a very nice glossy finish depending on the brand, but it doesn’t last forever. Epoxy looses it’s gloss much quicker than polyurethane or polyurea clear and color coats, which can be just as glossy. Polyurethane is also less slippery than epoxy if you elect to go without an anti-slip additive, but it’s not going to be slip resistant. I just had my garage floor done less than six months ago an I have the “Hot Tire Pick Up” problem. Can I patch the places where the epoxy has come up and how do I do that? or do I need to redo the whole garage? Hello Jeffrey. In most cases you can patch it. You didn’t provide any info however on what type of epoxy system you have, how many coats, color flakes or no color flakes, clear top coat or not, and etc. Hi. Can you direct me on how to patch the floor from hot tire pick up? I am in the process of trying to find out exactly which process was used originally. Hello Susan. Patching epoxy for hot tire pick up is not easy. Coatings just don’t blend like paint does. 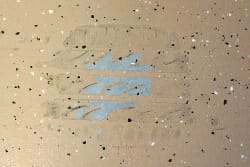 Before you start, you need to know exactly what product was used, what color combination of color flake was used (if any), and was a clear coat applied? I have an epoxy floor applied by the builder in south Florida. It was damaged by my tires last summer and repaired under the warranty. I am looking for a mat that I can put down to prevent damage in the future. What type of mat should I buy? Hello Lynn. You can use just about any type of mat that is approved for use on a garage floor. The DryMate mat is a popular choice. It’s not as heavy or expensive as the vinyl mats and it comes in more manageable sizing to use as a parking pad. Your article mentions that the water based epoxy is not as durable if I read that right, but then you mention epoxymaster, which IS water soluble. Can you clear this up for me, and also what is the slip quotient in these floors? Hello Miranda. Maybe you are confusing EpoxyShield by Rust-Oleum with EpoxyMaster. EpoxyShield is a water based product that will suffer hot tire pickup at some point during it’s lifespan. EpoxyMaster is a commercial grade 100% solids epoxy. There is no water and less than 1% solvents. These coatings are not slippery when dry, but they can be slippery when wet, especially when new. If a wet garage is a concern, we recommend adding an anti-slip additive to the final coat.